Tales from around the Pot Belly Stove. Smith's General Store, home of the pot belly stove tales, was open from 7:00 am to 10:00 pm, Monday through Saturday, and by request on Sundays after church services if someone needed a gallon of milk or a loaf of bread for Sunday dinner. Panther Fork, Slab Camp and Bush Run roads all converged in the center of town and intersected with US Route 20. 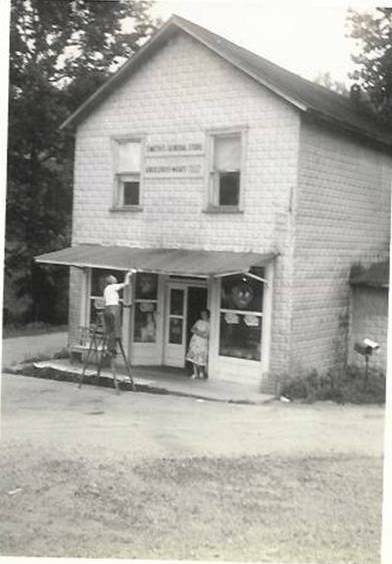 The store provided the staple foods and necessary supplies to sustain life, from milk to kerosene, horseshoes to five buckle artics, salt fish to rolls of bologna, bananas to plug tobacco, as well as bread and canned goods. Located in the center and towards the back of the store was the pot belly stove, which became a favorite place for folks to gather and loaf, play checkers or catch up on the community social events and even gossip. It was a silent friend in the warmer months, willing to take the chill out of the air on cool summer mornings and would warm the body and soul from the biting winter air. While providing heat and comfort to the patrons, that ole' stove was a witness to many a tale from the local codgers. These tales were a form of community entertainment as well as a challenge for the participants who engaged in a competition to tell the best tale. My childhood exposure to the humor and somewhat exaggerated details relayed in these stories has been a contributing factor in my vision and creation of Scruffy & Pals. Although these narratives were not intended to be entirely accurate, their presentation and purpose was to trigger a reaction that would warrant the honor of being the best tale of the day. I have written them as best I can recall, dealing with the years that strain my memory, and I hope that while you are reading them you can visualize the anticipation, excitement, humor and warmth that was present around that ole' pot belly stove. If you would like to be notified when a new tale is added to this page, sign up on the orange RSS feed above left. Click here to visit the Pro Shop.